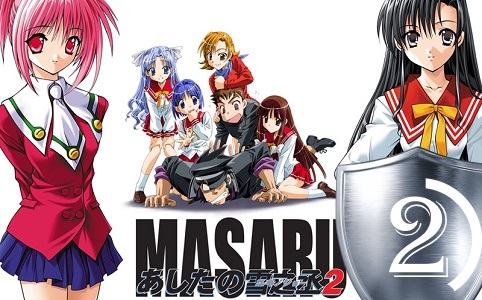 Despite trying it’s best to trick you it’s a sports anime about boxing, Masaru: Ashita no Yukinojo 2 (Masaru: Tomorrow’s Yukinojo) is a run down the mill romantic comedy. It’s true that the protagonist used to do boxing and has a complicated relationship with it, but throughout the whole novel there is but a single fight and that too, not exactly a central happening in the plot. Masaru is a loudmouth, low brow guy, but his kindness and displays of genuine care toward his friends and relatives make him into a fairly likable character. Moreover, his complicated relationship with boxing adds some extra spice to the overall story. Heroines, on the other hand, are a bunch that could be found in any visual novel regardless of its theme, with a possible exception of the boxing club manager. Anyway, romantic relationships here are barely related to sports and, though fairly well-written, are predictable and, kind of, boring. The girls are still fairly likable and interesting, but also very unlikely to stay in your memories for long. The best moment in the visual novel is found in its epilogue as the protagonist finally decides to directly approach his boxing-related worries, but, at the same time, it’s a chapter unrelated to any of the girls, making all of their stories feel redundant to the overall theme and point of the novel. All in all, a somewhat entertaining read, mainly due to likable characters, but not really memorable in any special way. You won’t lose much by skipping this one. Oh yeah, this VN was also written by a completely unknown writer, Inoue Keiji, who has just recently re-surfaced after a ten year long hiatus with a fairly highly-acclaimed Artemis Blue, which I haven’t read yet.